Vancouver is one of the few places in British Columbia that you can catch salmon 365 days a year. Right now and through the winter you can catch Chinook Salmon in Vancouver Harbour and surrounding region, most of the salmon are between 4lb ( shakers) to 12lbs ( Keepers) with the occasional Chinook in the 16 to 20lb ( Slab) range. One of our associate guides were out this week having good success fishing the Harbour. Most fish were in the 4 to 6lb range but they did manage to catch a few fish in the teens. Vancouver Harbour offers fair to good winter salmon fishing from Jan through until the spring runs begin to show up. Crab and Prawn fishing is also very good in winter usually producing limits on every trip. We were out on the water a couple days this past week, we managed to land 19 fish in two days which is pretty good for this time of year. Nothing larger than 4 feet but we had enough action to keep us busy on the rods. Sturgeon fishing is generally slow in winter months but if you put in the time it is still worth a try. Our boats are on the water year round so if you’re like me and cabin fever is already setting in, give us a call, we would be happy to get you out for a morning, afternoon or all day trip. Vedder River Steelhead fishing has been fair to good this past week, some nice fish taken in the lower river as well as the mid river area. Water clarity is 16 to 20 inches with water steadily dropping and clearing. Freds Tackle reports about 6 to 10 fish per day being weighed in which means that there is probably closer to 20-30 fish per day being landed. Although there are some nice steelhead in the Vedder it appears to me that we are off to a slower start than last year. Weather is calling for sunshine for the next two days so the river should continue to clear and drop until the next rain fall. I was by the Chehalis the other day and forgot how beautiful this river is during winter months. I saw a few Coho stacked in a pool that still looked very clean. We have heard of a few early Steelhead and some great Cutthroat Fishing. The Chehalis fishes very well after a big rain, it drops and clears very quickly so the next few days should produce some nice fish. This is a great river system for fishing when Vedder River conditions are not favorable. We did a Jet Boat Cruise on Sunday with a group from Mission to Rainbow Falls on Harrison Lake. It was a beautiful Winters day and everyone enjoyed the trip. Along the way we saw several Cutthroat rise near Kilby Park and as we got further up I was surprised on how many rising fish we saw. After talking with a few of our guides, we heard that Cutthroat fishing is good right now on the Harrison. If you’re going to give it a try, I would suggest using minnow patters or flesh fly’s. You can also fish larger gear looking for Chehalis bound Steelhead. Cutthroat are nomadic and move around allot so when your fishing the Harrison spend a considerable amount of time watching the shoreline. If Cutthroat are feeding, you will spot them as we did on Sunday. 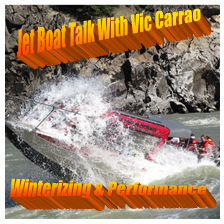 New Article on Jet Boats. The article covers winter storage, performance upgrades and some pet peeves. http://www.nationalprostaff.com is a new website built for Pro Staff Teams and avid anglers who like to get the most updated information on products, fishing reports and even get a sponsorship. The top Pro and Amateur anglers have a profile as well as Teams such as my Team at Pure Fishing. You can sign up for free then follow your favorite anglers. If you are looking to get out on the water over the next few weeks we are still fishing the Vancouver Region for salmon and local rivers in the Fraser Valley for steelhead, sturgeon and trout. Have a great week and keep those reports coming in.